As scientists across the globe explore the atmospheric impacts of greenhouse gases such as methane and carbon dioxide California State University, Northridge atmospheric chemist Mads Sulbaek Andersen looks to find a replacement for an unassuming yet ubiquitous source of global warming — a fluorinated sulfur compound known as SF6. 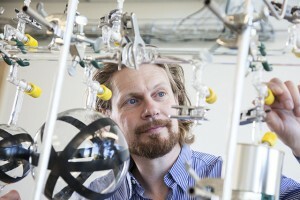 An international research collaboration between lead-author Sulbaek Andersen and co-authors at Copenhagen Center for Atmospheric Research (CCAR) and University of Oslo shows that a new replacement compound could reduce the carbon footprint of SF6 usage by at around 93 percent. Their study has just been published in the journal Environmental Science and Technology. SF6 is used in high-voltage circuit breakers and transformer stations across the world as a nonconductive gas. Although it is nontoxic, on a molecular level its impact on the environment is significant. CSUN atmospheric chemist Mads Sulbaek Andersen measures the Global Warming Potential of compounds that may go into the atmosphere using custom lab equipment. Photo by Lee Choo. Sulbaek Andersen explained the high impact SF6 has on the environment. The proposed replacement compound 2,3,3,3-tetrafluoro-2-(trifluoromethyl)- 2-propanenitrile was studied for its atmospheric lifetime and global warming potential (GWP). GWP is used to measure the integrated climate effect of one kilogram of a substance compared to one kilogram of carbon dioxide. The lifetime of a compound is measured by how long it takes for it to break down into and disappear from the atmosphere. Its ability to absorb thermal radiation also is a major factor of a compound’s GWP. SF6 has a lifetime of 3,200 years and a GWP integrated over 100 years of nearly 24,000 times that of carbon dioxide, making it the most potent greenhouse house gas known to man. The new compound’s lifetime is 22 years and its GWP 1,500. CSUN atmospheric chemist Mads Sulbaek Andersen observes the Global Warming Potential of certain compounds utilizing custom made equipment. Photo by Lee Choo. Sulbaek Andersen said the industrial implications for the new compound are major, and give hope for the process of continued environmental improvements for the future.